I LOVE this time of year! 10 years ago, in early October, I moved to Petersfield from London. After 15 years living in the capital, I was (to put it mildly) a bit worried about moving to the middle of nowhere, as I then saw it. But after a couple of weeks spent driving around my new home area as autumn took hold, I realised that I had made a very very good move. The immediate area around Petersfield is hilly and wooded and the countryside is stunning. And there are so many beautiful trees that, 10 years on from my move to the sticks, I still find this time of year a real thrill and can’t quite believe how lucky I am to live here. In this part of Hampshire we have the Hangers – ancient beech woods covering the hills nearby and which can be seen for miles around. 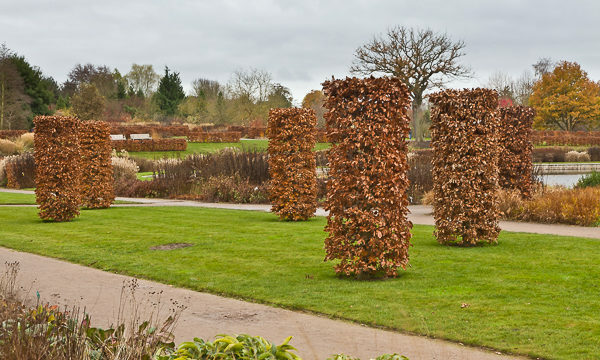 They are a brilliant coppery orange at the moment. Stunning! My work takes me in every direction from Petersfield which means I get to design planting schemes for very varied conditions. 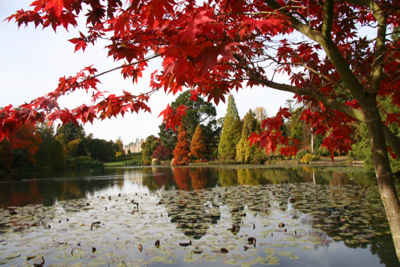 Up around the Surrey borders the soil is predominantly acidic, so trees like Acers (Japanese maples) and Liquidambars do very well. At this time of year, it’s great to drive around and spot the brilliant red of these trees in gardens all over the area. Liquidambar styraciflua ‘Worplesdon’ is a particularly attractive tree (with leaves not unlike an Acer) and it makes a great focal point as a single specimen. It prefers soils which aren’t too dry (so no good on shallow chalky soil) and reaches a mature height of about 15 metres, so it needs space. 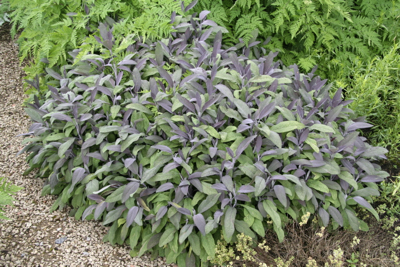 It will grow on more neutral soils, but the best autumn colour is achieved on acid soils. 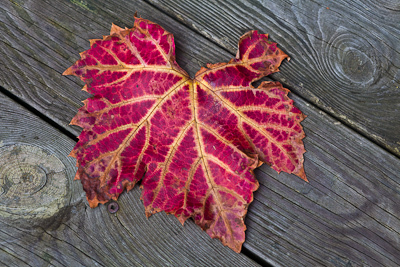 If you have alkaline soil, apparently it’s possible to improve the leaf colour of Liquidambars by adding sulphur to the soil (by spreading sulphur chips). It needs to be done over a number of years and takes a while to take effect. It’s not something I’ve ever done, but I’d love to hear from anyone who has tried it. In my own garden where the soil has a neutral pH, I have a multi-stemmed Silver Birch tree (Betula Jacquemontii) whose leaves are currently a bright buttery yellow and look fantastic next to the brilliant white of its bark. Silver birches are very tolerant trees, thriving in most (but not waterlogged) soils, and they are great value throughout the year by virtue of their stunning bark. I use them a lot in gardens for that reason (often in chalky soil where choice is more limited). 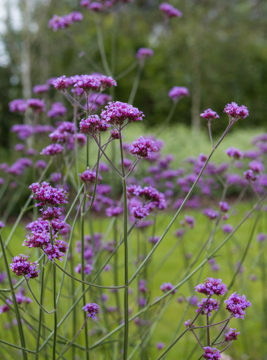 I particularly like them in small groups, and preferably with an uplighter in the ground below ensuring they can be seen at night too when they make a statuesque addition to the garden. 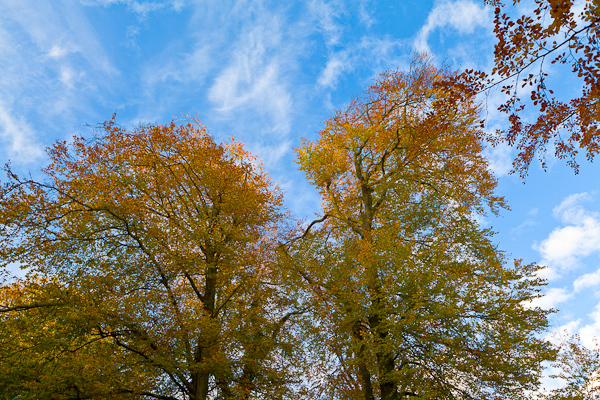 If you would like to know a bit more about why leaves change colour at this time of year, the Royal Forestry website has lots of interesting information. There are many beautiful small trees to choose from for autumn colour – Acer palmatum and Amelanchier lamarckii to name but two – or you could take your pick from the Cherry (Prunus) family and also Crabapples (Malus). One of the best crabs for autumn colour is Malus Tschonoskii, and of course the other advantage to planting a crabapple is that they offer not only lovely spring blossom and autumn colour, but also coloured fruit in autumn. Take some time now to identify where your garden could benefit from a splash of colour at this time of year. Looking at which trees are succeeding in your neighbours’ gardens is also a useful way to get an indication for what will work for you, and with the tree-planting season underway now, you can add some spectacular autumn colour to your own garden for years to come.